Most screeners only allow you to screen for absolute values (i.e., greater than or less than a specific number). 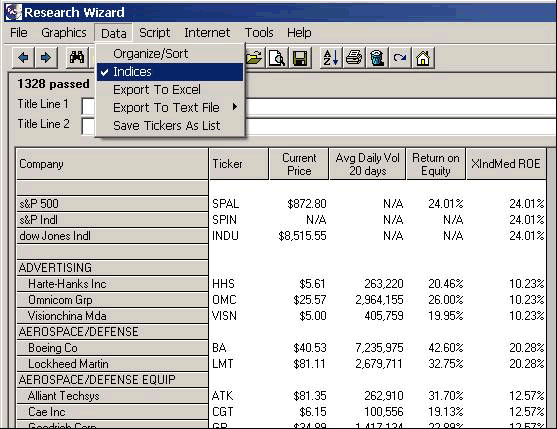 But with the Research Wizard, you can also quickly and easily screen for relative valuations and comparisons. Want to find stocks with values greater than or less than their respective Industry? Better or worse than its Sector? 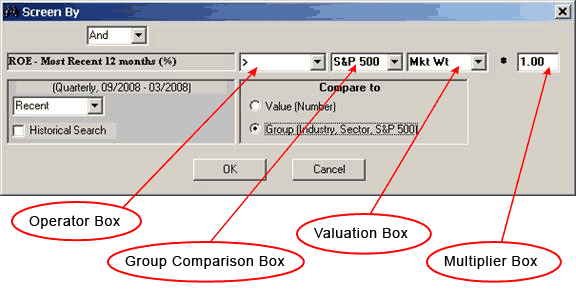 Compare values to the market like the S&P 500? You can. All with a few clicks of your mouse. This is a powerful way to screen. Especially when you consider that some industries might have higher or lower ‘normals’ for certain items. For example: if you’re looking for high Return on Equity (ROE) stocks, you might find that for some industries, the average ROE is 5 whereas another industry’s average is 20. If you only looked for companies with an ROE of 20, you could be overlooking many great companies and excluding many different industries. But by screening for stocks above the average for their respective industries for example, you’re now finding the top industry performers on this metric without inadvertently excluding anything. In this example, let’s say you wanted to screen for stocks with ROE’s that are 20% greater than the median for its relevant X (or expanded) Industry. 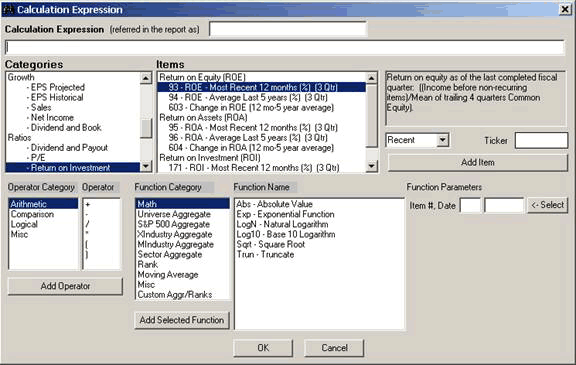 In the Items Window, under Return on Equity (ROE), select ROE – Most Recent 12 months (%). The Screen By Window will pop up as shown below. Select the Group radio button. 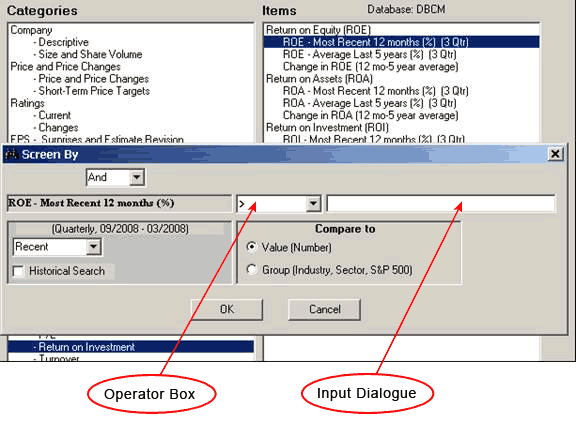 One you do, you’ll notice the matrix of boxes change from just two (Operator Box and Input Dialogue Box as shown above) to four (Operator Box, Group Comparison Box, Valuation Box and Multiplier Box as shown below). Then from the Operator Box, select the Operator as you normall y would. In this example, select greater than ‘ > ‘. Then, from the Multiplier Box, change the 1.00 to 1.20. This means we want only those stocks with ROE’s greater than 1.2 times (or in other words 20% greater than) the median ROE value for the stock’s respective X Industry. If we said 1.50, that would mean 1.5 times or 50% greater than the median. 2.00 would be 2 times or 100% greater than the median. And 0.80 would mean greater than at least 0.8 times or 80% of the median value. Then click OK and your Relative Comparison in complete. 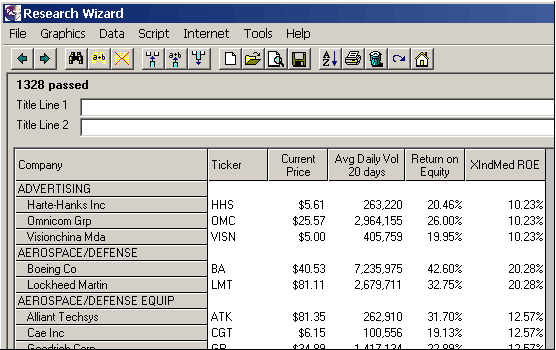 When you run your screen and generate your report (by hitting Run Query), your report will show you the Company, Ticker, Current Price, Average 20 Day Volume and the stock’s ROE. However, if you also want to see the X Industries ROE as well, you can add that to your report as well. 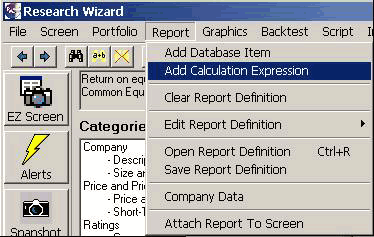 On your Menu Bar, select Report and then Add Calculation Expression. 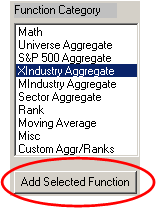 In the Function Category Window select X Industry Aggregate. 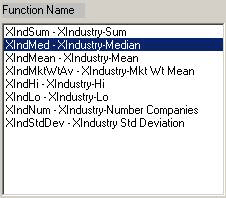 In the Function Name Window, select XIndMed - X Industry-Median. Off to the right, click on the Select Button and the two small boxes to the right of it will populate with 93 and Recent (which stands for item number 93 which is the ROE). dialogue box at the top. To make the Report more user friendly, add ROE to the description that’s already in the Report Description Box (referred in the report as box) so we’ll know what that value is if we were to look at it again at a later time. The X Ind Med ROE will be added to the Report Definition Table as displayed below. If you’d like, you can change the format of how the XIndMed number is displayed. If you’d like to change it to a percentage like the stock’s ROE, just follow these steps. 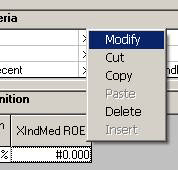 In the Report Definition Table, left click the XIndMed ROE (so a small marquee surrounds the cell), then right click it and select Modify. 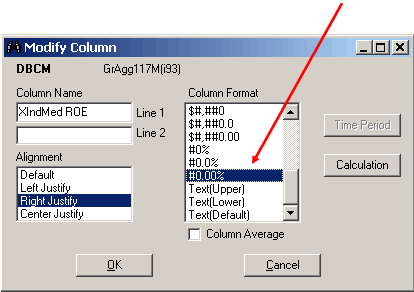 When the Modify Column Window pops up, scroll down on the navigation bar in the Column Format Window and select the desired format. For this example, we’ll select the #0.00%. You’ll then see the new format in your Report Definition Table. Now your Report is ready. On your Menu Bar, select Data, then the Organize/Sort option. Or as a shortcut, click on the AZ Button on the Tool Bar. 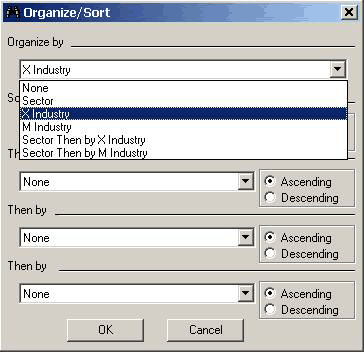 When the Organize/Sort Window pops up, drop down the Organize Sort drop-down box and select X Industry. Your Report will now be sorted by the X Industry. In the Return on Equity column, the stocks ROE will be displayed. 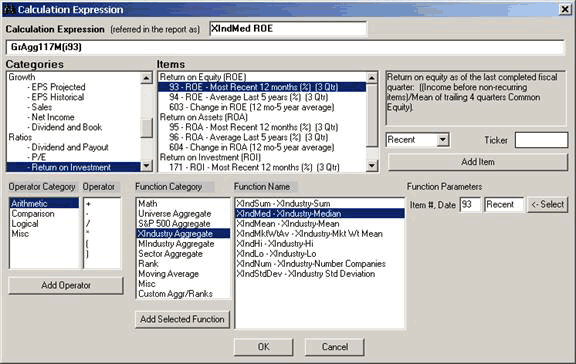 The X Industries’ Median ROE will be displayed in the XIndMed ROE column, the X Industries’ Median ROE will be displayed. Go to Data on your Menu Bar and select/deselect Indices. The Indices with then be removed from the Report. To save your Screen or Report, just go to Screen and Report on your Menu Bar from the main page and follow the prompts to save them. Try using Relative Comparisons in your own screening and see what kinds of new stocks come thru (or get excluded). Knowing how your stocks stack up in comparison to its Sector or Industry or the Market can help you find just the right companies. And of course, finding the ones underperforming their Groups or the Market can help you spot great potential short candidates too. And yes, Relative Comparison screening can also be backtested. Try using this powerful screening technique today.